Browsing interior design and decor ideas on Instagram and Pinterest can be seriously intimidating. Where do people even find all that money to spend? The good news is that you don’t have to earn a six figure income to give your kids the bedroom they deserve. And you know they deserve it. It’s important for children to feel a sense of connection to their room. Why? 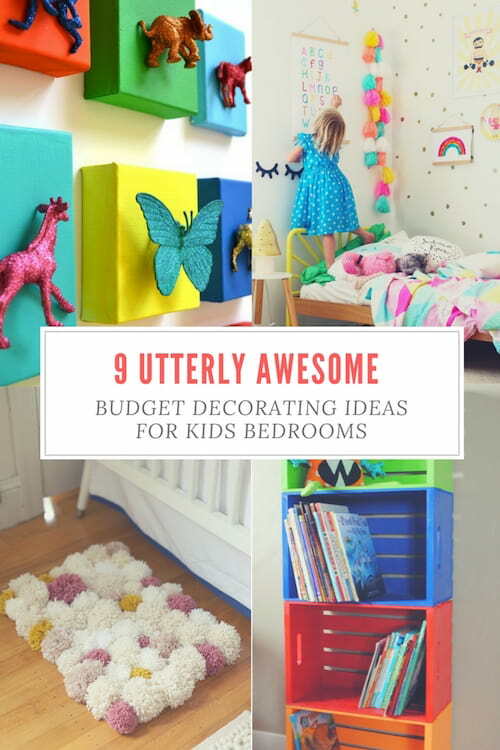 So hop them on your knee as you both check out these utterly awesome budget decorating ideas for kids bedrooms. This DIY Mummy blogger has put together an awesome and easy tutorial. To build this stylish headboard you will need plywood, fabric, batting, foam, staple gun, d-rings, picture wire and picture hangers. From there you combine a bit of (super easy) woodwork with a bit of craft to create something for your child’s room that could’ve come straight from a high end furniture store – but better! Gone are the days when the only budget option for personalised photo art was DIYing your own wall collage using scissors and Blu Tack. Take your photo displays to the next level – and give them some childlike charm – using fun collage templates from our modish and silhouette range. 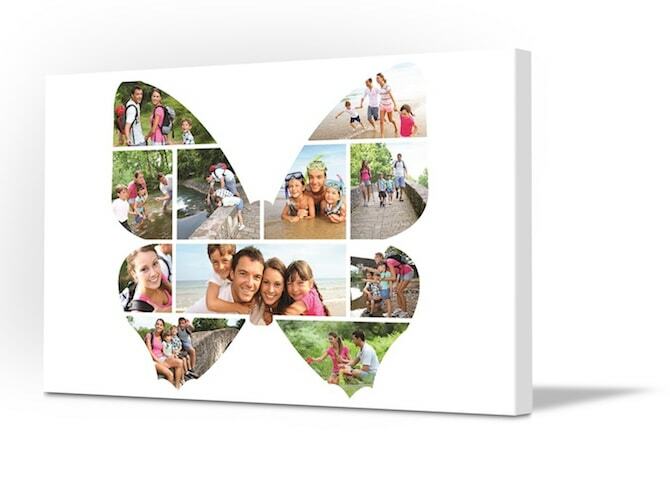 This butterfly collage provides a massive 11 frames; heaps of space to include your child’s favourite family photos. How bright and cartoony is this? Those bold primary colours will bring so much attitude to a child’s room. 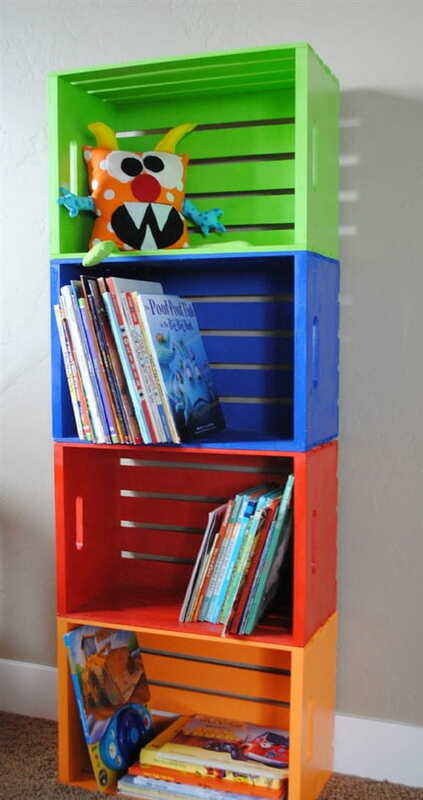 This DIY blogger made this for her 3 year old son’s room. Who else reckons it will be there forever? All it involves is super cheap unfinished timber crates, a lick of paint and some screws to hold it all together. Awesome. This Mum has done all the hard work for us by creating downloadable alphabet charts you can print and hang onto your child’s bedroom wall. If you’re not a fan of the more whimsical upper and lower case letter design, you can choose to have all lower case or all upper case. Beats paying a fortune for one from the shop right? 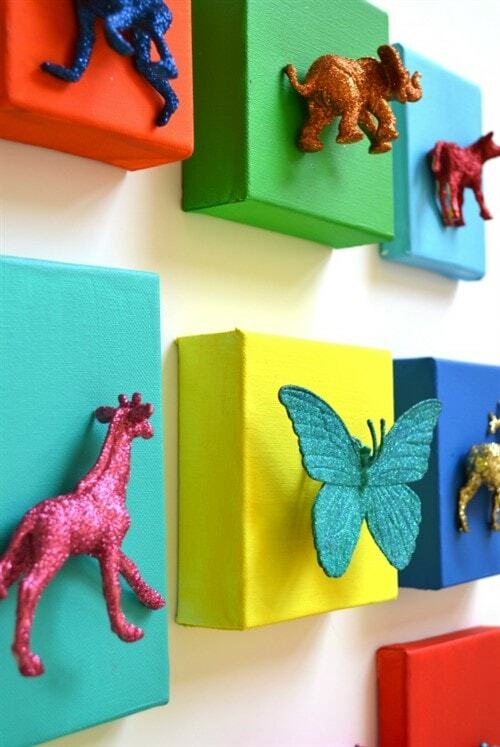 These glitter animal canvases are so very cool. All you have to do is buy a whole bunch of tiny square canvases then go to an op shop (or toy shop!) and find some rubber animal toys. 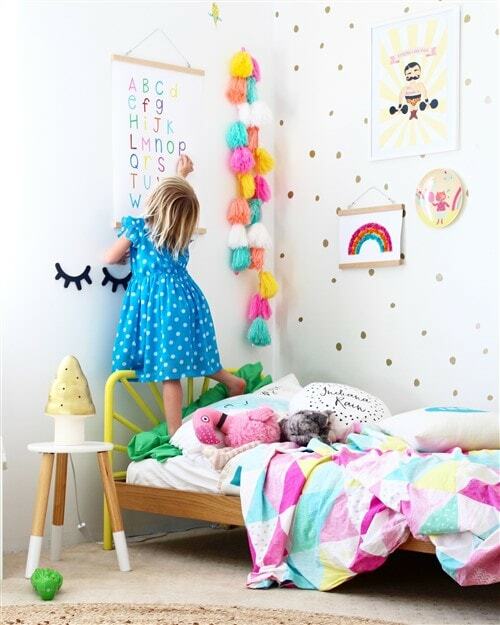 Paint the canvases whatever colour palette will suit your child’s bedroom decor then dowse the toys in glue and glitter. So arty! So fun! 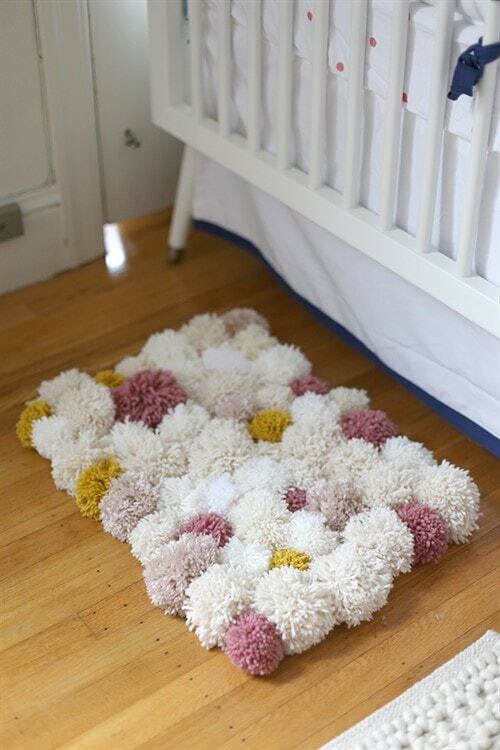 The thing I love most about this pom pom rug is that it’s not massive in size which means it’s an achievable rather than daunting craft project. This is a wonderful treat for babies and kids alike as it feels so good under foot! The best thing is, you don’t even have to know how to knit! Yay! 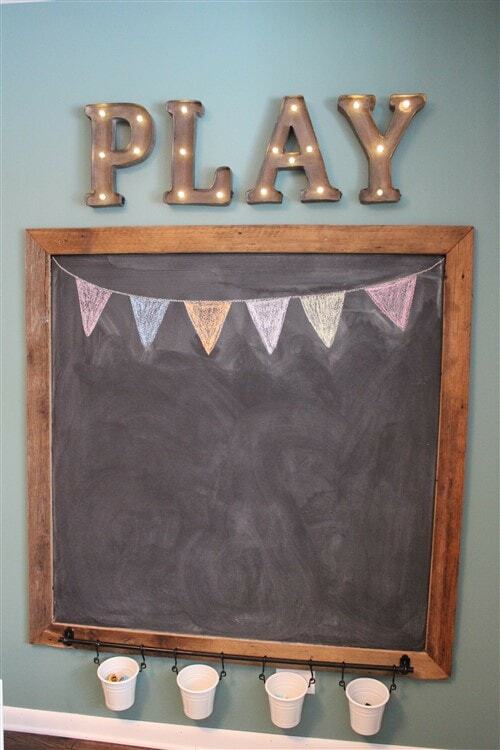 How utterly awesome are the plastic cup chalk holders in this DIY chalkboard? When you buy a chalkboard from the shop, have you ever noticed there’s never enough room to store the chalk? This DIY design solves that problem. The other nifty thing about this design is how much personality it holds. There’s nothing generic about it. it’s all so different from ‘store bought’ from the colour of the timber right down to the lit-up ‘play’ wall art above it. 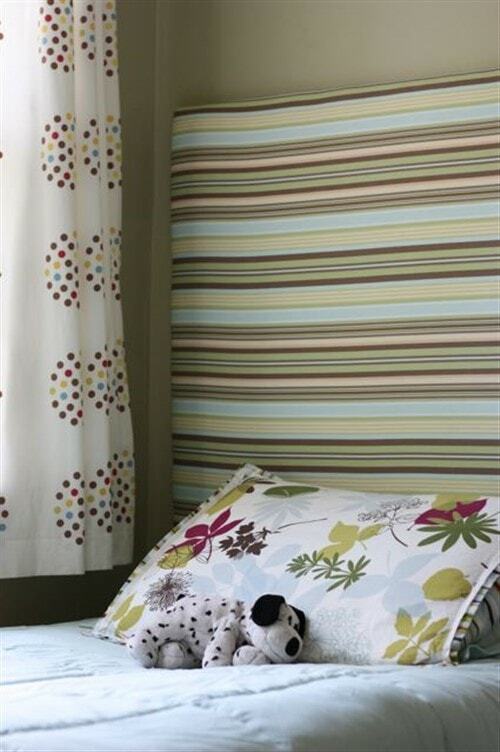 With this in their bedrooms or playrooms, your kids will be expressing their creativity exactly where they’re meant to! In designing this waterfall of hearts, this DIY blogger was inspired by circular mobiles. The difference was creating a design that could instead sit against the wall. Cutting out the 160 colourful hearts might take some time, but that patience will sure pay off. This is gorgeous! You can never have too many pop poms right? Something to match the pom pom rug perhaps? 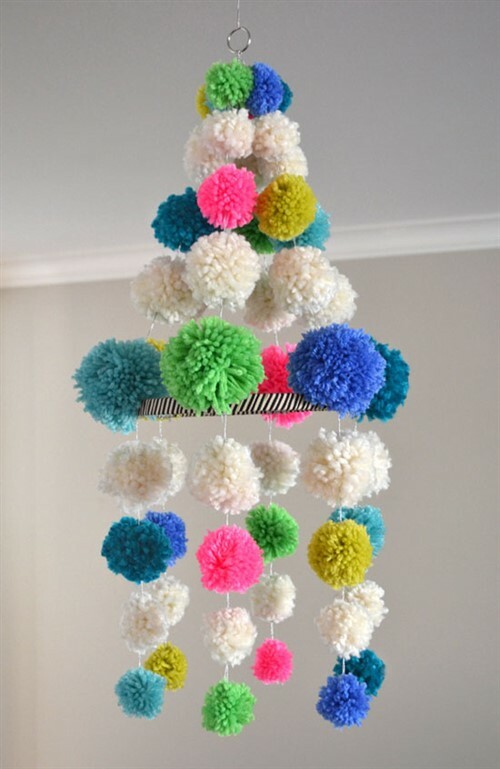 This chandelier is a labour of love with 54 pom poms to make. There’s no need to make them all at once. Space them out over a few weeks. You’ll be a pop pom DIY master in no time! The rest of the project is easy. And cute as. So much childlike wonder here.